For a thousand years from about the 5th to 16th centuries, manuscripts were embellished with beautiful illuminations. The word illumination is derived from the Latin word ‘Illuminare’ which means ‘to light up’. 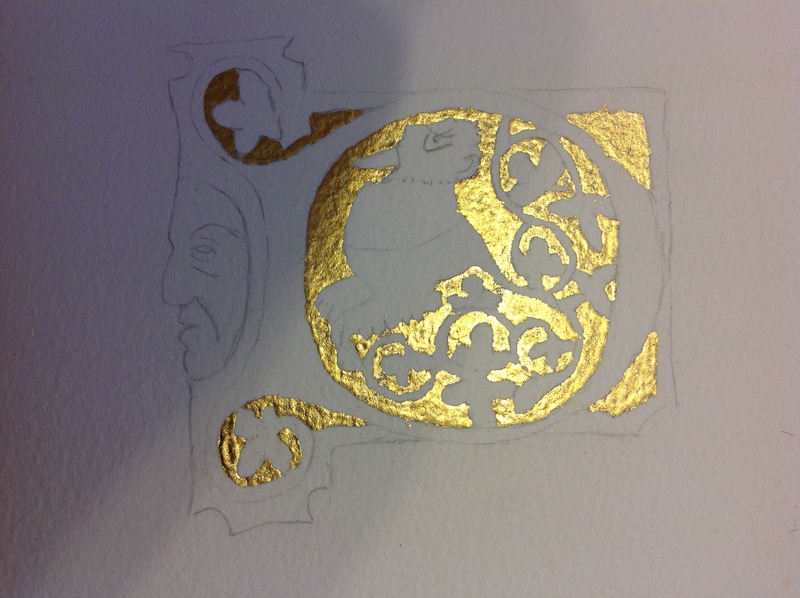 This comes from the use of gold or silver leaf in the illustrations. The type of gold used was shell gold (which I’ll explain in another article) or leaf gold. Gold is very malleable and leaf gold was made by beating gold flat to a hairs width. First a drawing must be made. In medieval times this was done using charcoal or a silver point to sketch it. 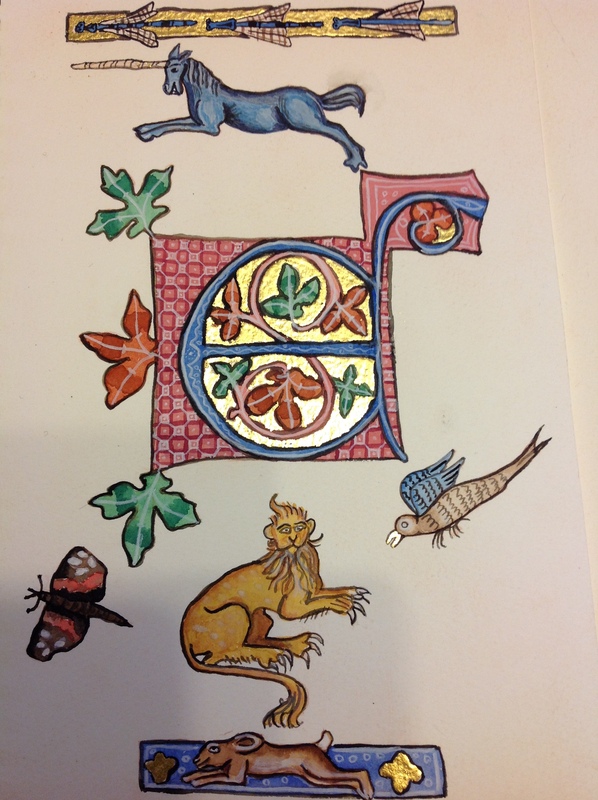 Not being such a competent and inventive artist I copied an illustration from the Luttrell Psalter, a manuscript commissioned in the early 14th Century (the entire electronic version of the manuscript is available to buy from the British Library). I traced a copy of the image using modern tracing paper and pencil. 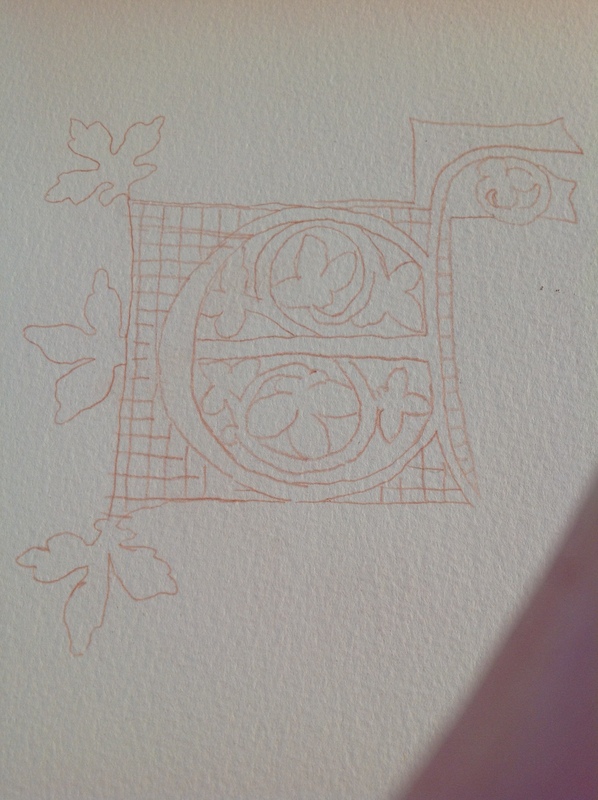 Then I covered the reverse of the tracing with a small amount of red bole (red clay) and traced with a pencil over the original pencil tracing. This left an impression of the drawing in red bole on the paper, which can be seen left. 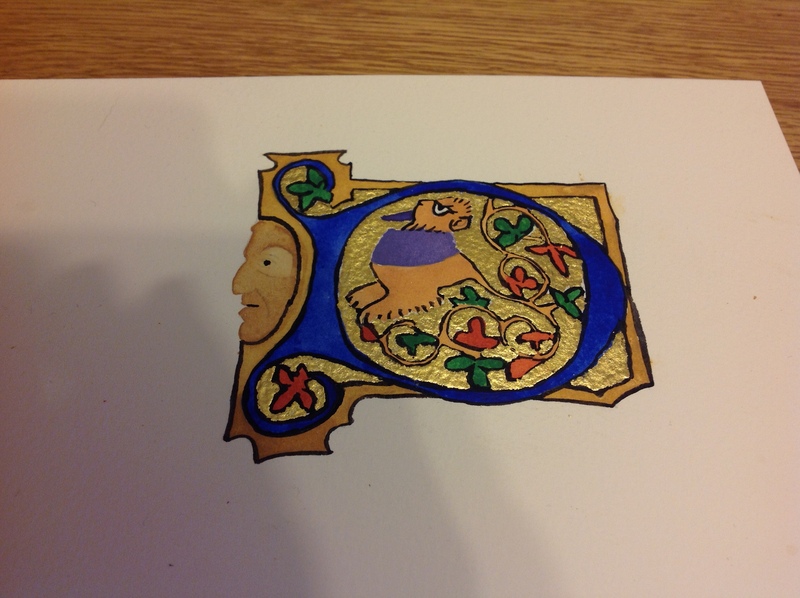 Next I had to apply a mordant to the page for the gold to stick to. Gold is applied before paint as it is possible for gold to stick to paint too. I used gum ammoniac which is a type of resin taken from a plant called Dorema ammoniacum. Garlic juice was also used as a mordant in medieval times (I tried this but didn’t find it as effective as GA) . Gesso is also another famous mordant, which allows for making raised layers (so the letter stands proud of the page). But I’ll write about gesso in a later posting. The gold is carefully applied to the areas where you want the gold to stick, using an old brush (don’t use sable brushes for this). You paint around the edge of the shape with GA first and then flood the mordant into the space (this stops it flowing over the edge where you don’t want it to go). Then the gold leaf is applied. 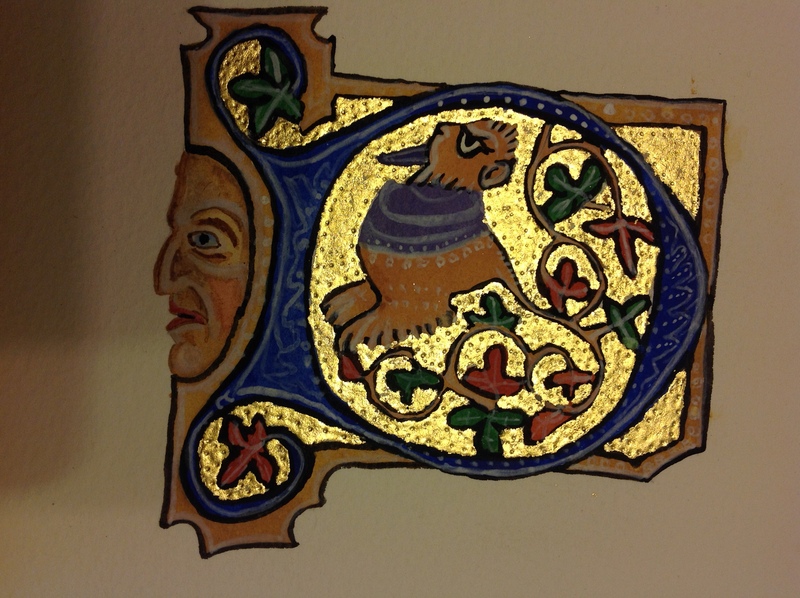 Traditionally, it would have been loose sheets of gold leaf. I have done this before but the slightest breath is enough to send your gold flying away from you! A piece of gold is cut using a gilders tip to the size of the area you want to cover, then a squirrel hair brush is rubbed on the cheek or somewhere to get static which is enough to pick the gold off the pad. The mordant needs to be ‘reactivated’ by blowing warm breath on to it. Some people use a tube of paper to do this. The gold must be applied straight away. 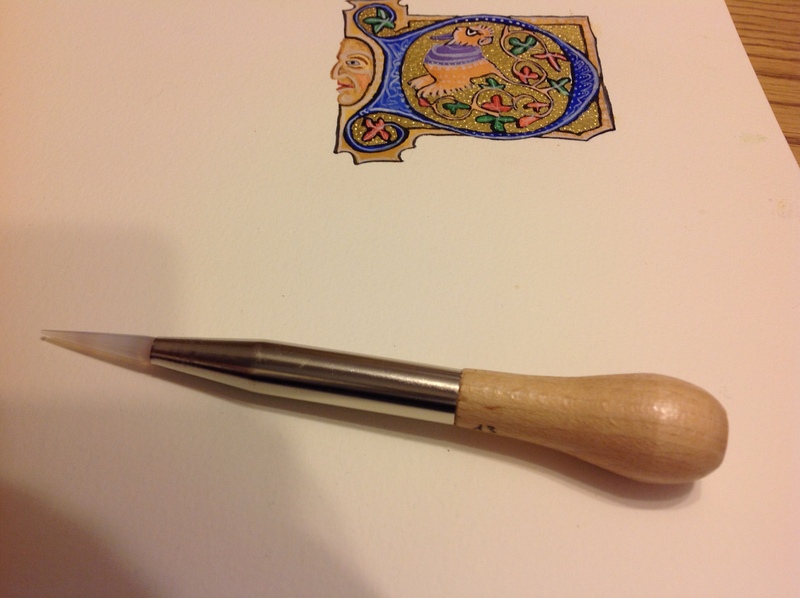 A piece of glassine paper is then placed over the gold and it is pressed on using the thumb or a burnisher. The paper is removed and excess gold is rubbed off using the brush. The tiny bits of gold leftover should be saved to make shell gold. The gold can then be burnished with an agate dogs tooth burnisher (so called as it’s shaped like a dogs tooth). As the agate is so smooth it won’t scratch the gold and will buff it up and give it more of a shine. The next stage is to apply the paint. This is done in stages. Washes of colour are applied first. This is done in the same way as applying the GA by outlining and flooding the colour in. This ensures that it does not leak over the edge and that the colour is applied evenly and not blotchily. Then the black outlines are added which are so prevalent in a lot of these illuminations. 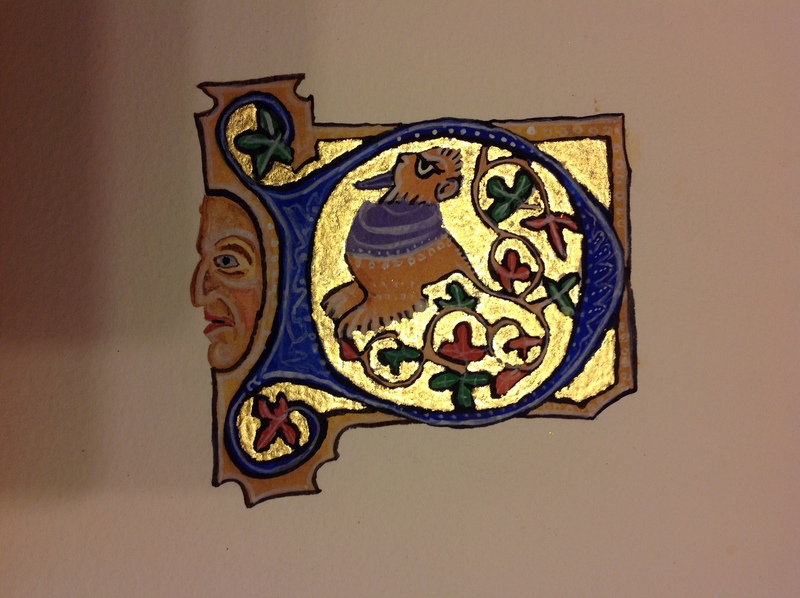 Then the white highlights are added, that help to give the illumination more depth. The finest of sable brushes must be used for this purpose as the work is so small and detailed. Finally I added indentions into the gold with an agate pencil burnisher (this could have been done after burnishing I guess), which really helps lift the illumination. Then you’re left with the finished illumination.